This much I know about…how Appraisal can help improve the quality of teaching in schools!? I have been a teacher for 27 years, a Headteacher for 12 years and, at the age of 51, this much I know about how Appraisal can help improve the quality of teaching in schools!? The belief that there are thousands of consistently inadequate teachers may be like the search for welfare queens and disability scam artists—more sensationalism than it is reality. It’s the law! The latest DfE advice on Performance Related Pay is unequivocal: Schools need to ensure that their pay policies are clear that performance-related progression provides the basis for all decisions on pay – for classroom teachers and leaders. Make a legislative imposition work to your advantage. An effective Appraisal process can be a genuine asset. It is a given that Appraisal processes have to be consistent and fair. But more than that, good Appraisal processes will sit coherently within a school’s Continuous Professional Development system. Rather than an awkward legislative hoop-jumping burden, Appraisal systems can be designed to improve the quality of teaching in a school to the benefit of everyone concerned. 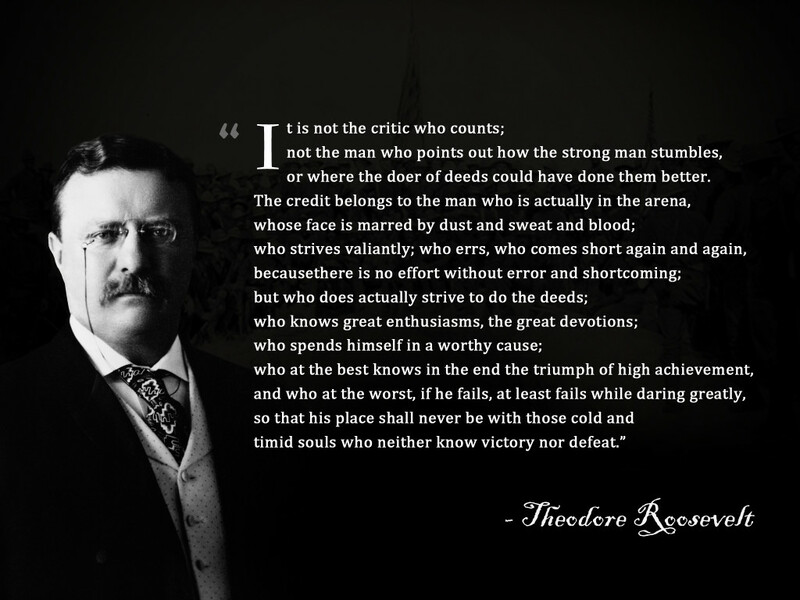 It is not the critic who counts. In his book The Checklist Manifesto, Atul Gawunde talks about critics who stand outside of medicine making negative judgements about medical practitioners who make mistakes; he may just as well be talking about teaching: …the judgement feels like it ignores how extremely difficult the job is. Every day there is more and more to manage and get right and learn. And defeat under conditions of complexity occurs far more often despite great effort rather than from a lack of it. The thing is, that is where the comparison with teaching diverges slightly, for in the next sentence he says this: That’s why the traditional solution in most professions has not been to punish failure but instead to encourage more experience and training. In the best schools I know, teachers at all levels of competence are encouraged to improve their practice; in the worst schools, a climate of fear reigns and teachers who find the job challenging can be left unsupported, made to feel inept, and often go on to leave the profession. The thing is, teaching is a damned tricky business, as Lee Shulman recognised in The Wisdom of Practice: After 30 years of doing such work, I have concluded that classroom teaching…is perhaps the most complex, most challenging, and most demanding, subtle, nuanced, and frightening activity that our species has ever invented…The only time a physician could possibly encounter a situation of comparable complexity would be in the emergency room of a hospital during or after a natural disaster. Performance Development, not Performance Management. In their appositely entitled paper, Good Seeds Grow in Strong Cultures, Saphier and King say, If we are serious about school improvement and attracting and retaining talented people to school careers, then our highest priority should be to maintain structures that nurture adult growth and sustain the school as an attractive workplace. The real work of a Headteacher. In the end, our leadership activities as Headteachers in creating a culture for students and staff to thrive have to lead to improved student outcomes. Viviane Robinson’s extensive research into school effectiveness led her to claim that, The more leaders focus on their relationships, their work, and their learning on the core business of teaching and learning, the greater will be their influence on student outcomes. epitomises Roland S. Barth’s observation when he says, Show me a school where instructional leaders constantly examine the school’s culture and work to transform it into one hospitable to sustained human learning, and I’ll show you students who do just fine on those standardized tests. Collaborate don’t compete. If you would like a copy of our Performance Development and Pay policies just email me at j.tomsett@huntington-ed.org.uk. This entry was posted in General educational issues, School Leadership, Teaching and Learning. Bookmark the permalink. 6 Responses to This much I know about…how Appraisal can help improve the quality of teaching in schools!? A really nice post packed with common sense and wisdom. I have my doubts regarding the extent to which common sense and wisdom contribute to the output of the SMTs of many schools, but this post reassures me that amid the desert of dispair there are oases of normaility. I especially liked the following paragraph. I would pass on my experience which is that many teachers find the job challenging not due to any shortcomings on their part but due to completely unreasonable workloads and expectations. This very weekend we see stories of record numbers of teachers quitting due to workload, we have junior doctors talking about quitting due to unreasoable workloads and midwives making the point that a shortage in staffing is leaving them with unreasoable workloads. We have carers expected to travel between appointments in their own time and social workers with worloads that tend to lead to potentially tragic outcomes. I feel that prior to stepping in to support teachers who find the job challenging by helping them improve their practice, leaders need to ensure that workloads are SMART. To link pay to performance in a situation where a teacher is unable to manage an excessive workload is wrong. Leaders have a legal obligation to protect the the mental health of their teachers and I am amazed that there are not more legal actions for breach of health and safety obligations. Yes support teachers who are struggling due to their own weaknesses, but firt ask whether difficulties are due to excessive workload.